With high-quality construction and imperial design, this board will serve you well for years to come. 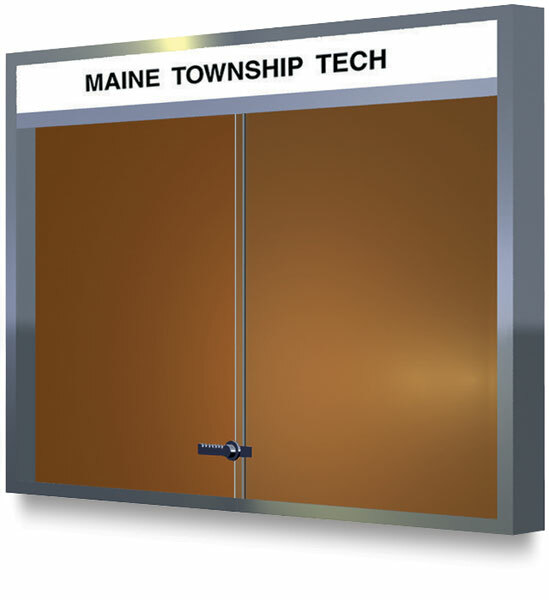 This board has a satin anodized finish and two sliding glass doors with heavy-duty locks. The perimeter is made of extruded aluminum. The inside case depth is 1½". Boards are available with or without a translucent acrylic head panel. Boards with the head panel are also available with fluorescent lighting. The poster panels are available in Natural Cork or Fabricork (fabric with cork underlay). Durable and washable Fabricork resists abuse from tacks and pins, and its punctures self-heal. The Natural Cork colors available are Tan, Denim Blue, and Black. Fabricork colors available are Dawn, Gray, Pacific, and Sterling. Note on Personalization — When ordering, please state copy desired in head panel and specify color of cork or color of Fabricork. Place this information in the Shipping Comments field that accompanies the Billing and Shipping page during your check-out process.